Extremely short post today, and mostly just me bragging. A few weeks ago I entered the painting competition for Spartan Games’ Halo: Fleet Battles tabletop war game. If you don’t know, Fleet Battles is similar to Star Wars: Armada or Star Wars: X-Wing Miniatures; like in Warhammer 40K you build a battle force of miniatures and pit that force against an opponent on a tabletop battlefield. The difference is that you build a fleet of starships. And if you haven’t figure out already, I love starships. 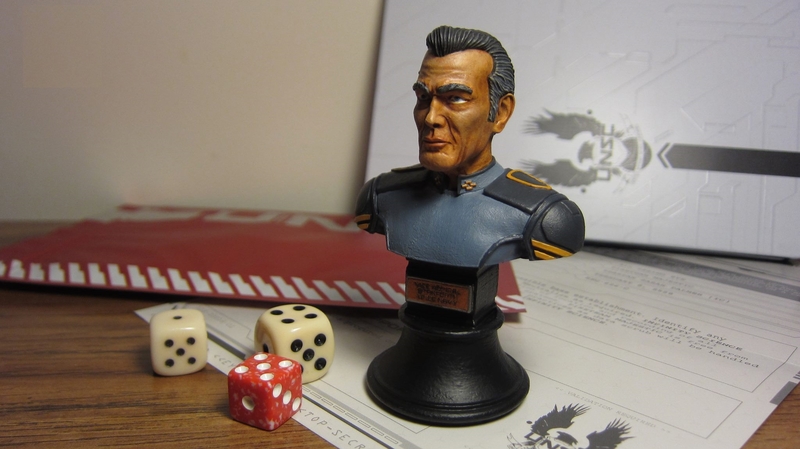 So I pre-ordered the starter set months and months ago, and as a result I was entered into their painting competition and was sent one of two “commander busts” by mail. I was hoping for the Sangheili bust; Rho ‘Barutamee’, but received Vice Admiral Stanforth instead. Stanforth, for you lore junkies, was the fleet commanding officer during the Battle of Sigma Octanus IV, and the person who promoted then Commander Jacob Keyes to Captain (as we know him from Halo: Combat Evolved). He later died during the Fall of Reach. An impressive man, to be sure. It was an honor to try and paint him. The results of my labor are below. I think I could have improved a lot of things here; I completely botched the plaque; way too much paint got into the lettering. My fault, and I wasn’t careful about that. I also think I should have made his skin tone lighter than it is to stay more in-line with the comics. Maybe in the picture they based the bust on he had a nice tan going on. Actually, I’m extremely happy with how it game out, baring the unfortunate plaque issues. The iris and pupils of his eyes, though now very visible here, are actually well painted; hardly breathed at all while I was doing those. Tiny details are hard. And the results of the painting competition? Spartan Games posted the results in their blog today. I’m very happy to see that, while I did not win first place (and thus the signed rules book) I was one of 10 runner-ups in the competition. That means I won a Halo gift box. Nice! I’ll of course make a post about the gif box whenever it comes in. Thanks to everyone who supported me!